Nuberg EPC is a global EPC and turnkey management company delivering landmark projects since 1996. One of Nuberg EPC's major wins for 2017 is the engineering and construction of a calcium chloride plant in Romania. Nuberg will work as a single point solution company from concept to commissioning in this project. The contract envisions setting up a turnkey project with production capacity of 90TPD. Nuberg won an anisole plant in April 2017 on EPC and LSTK basis in the Kingdom of Saudi Arabia. The plant will have a production capacity of 10,0000TPA, producing crude anisole. In early 2017, Nuberg was awarded a caustic soda plant in Algeria. The scope of the contract includes engineering, procurement, construction and commissioning. The project will set up a 17TPD chlor-alkali plant, which will produce caustic soda, hydrochloric acid and sodium hypochlorite. Other than winning contracts, this year Nuberg announced its crowning achievement of successful commissioning of two major industrial chemical plants. These include a calcium chloride plant in Abu Dhabi for Al Gaith Industries and a sulphur bentonite fertiliser plant in India. With the successful commissioning of these two plants, Nuberg proved its capability to execute various EPC projects across multiple international locations at the same time. Besides commissioning of these two plants, Nuberg is simultaneously executing three projects in Egypt. These projects are in full stream and are expected to be commissioned soon. For Nuberg, 2017 was a great year as the company ventured into the manufacturing business, establishing Indian Peroxide Limited (IPL), a specialty chemical company, currently manufacturing hydrogen peroxide and catering to major applications across industries. The plant is expected to be commissioned in April-May 2018. Swedish firm EB Nuberg, owned by Nuberg Group, has supplied hydrogen peroxide (H202) technology and know-how, while Nuberg EPC has provided with FEED, basic engineering, detailed engineering and turnkey project management services, including procurement and construction for the establishment of the plant. Nuberg offers single point responsibility solutions and services for engineering and construction of industrial plants, from concept to commissioning. 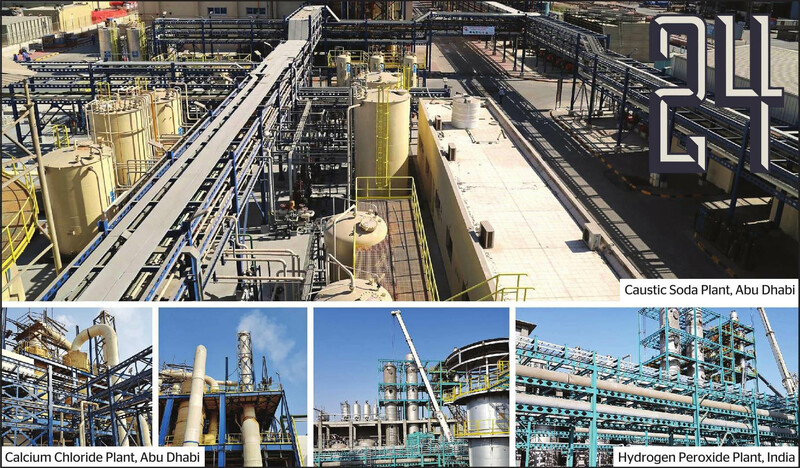 It is the vision and guidance of AK Tyagi, chairman and managing director of Nuberg, that has catapulted Nuberg among the world-class companies, making Nuberg a number one EPC company for the chlor-alkali industry in the UAE. 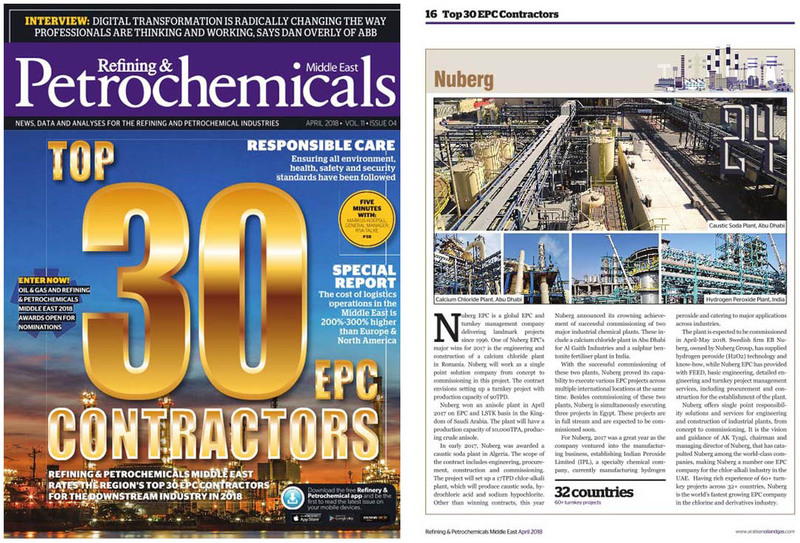 Having rich experience of 6o+ turn-key projects across 32+ countries, Nuberg is the world's fastest growing EPC company in the chlorine and derivatives industry. © This article was first published in Refining & Petrochemicals Magazine, April, 2018.